Notice: imagecolorat(): 50,100 is out of bounds in get_bg_color_edge() (line 1579 of /home/client/public_html/shiftnetwork/shift.theshiftnetwork.com/sites/all/modules/tsn_shared/tsn_shared.module). Downloadable MP3 Recordings of EVERY session in the 2018 Thriving in Your Third Act: Women Finding Fire & Fulfillment After 50 series series — listen on your computer, tablet, or smartphone! PLUS Your Bonus Collection including extraordinary recordings from the 2017 Thriving in Your Third Act summit series, helpful guides and ebooks for finding your health, freedom, and confidence, guided breathwork, and more! The visionary women who teach in The Third Act Wisdom Collection 2018 will provide their profound (and playful) wisdom, and support your personal journey of transformation into a juicy, fulfilling third phase of life. They offer deep insights, great belly laughs, and the practices and tools you need to harness your (possibly forgotten?) passion and direct your energy toward creating the life of your dreams — it’s not too late! — while bringing much-needed change to your community and our world. You’ll discover profound insights and practical tools to embrace your unique gifts and launch them into action in a way that activates your joy and power — and your capacity to create positive change in today’s chaotic world. With The Third Act Wisdom Collection 2018, you'll own the teachings to support your continued growth and connection with your true Self, and tap into a profound sense of wellbeing and purpose. Passing beyond midlife initiates a new life stage, bearing with it high anticipation, celebration, and, sometimes, outright terror. If you’re determined to make the next stage of your life as vital as the decades that have come before, this self-guided retreat is for you! Build an inspired plan for the future... including your aspirations, relationships, practical decisions, and well-being. Throughout our "second maturity," we gain access to capacities that are as great or greater than those of our earlier life. Join Jean Houston, philosopher, author, and futurist, as she speaks to another level of wisdom and spiritual power that only life experience can bring. She discusses the advantages of being in your second maturity, the difference between being an elder and being elderly... and ways to invite the younger generations to receive the contributions you're meant to make in the world, so you can feel the impact of your own legacy. The 10 tips offered in this guide will give you fresh, updated, pro-aging, savvy communication tools to light up your self-image and banish negative self-talk. These simple yet powerful guidelines will charge up your life force energy, passion, and vitality in unexpected and delightful ways. Grandmother SaSa is a seer, dreamer, and universal hands-on healer. She spent many years gaining inspiration and teachings from honored Cherokee medicine woman Nakai Breen. In this recording, Grandmother SaSa shares a prayer by Grandmother Nakai, which she left for the people. Grandmother SaSa also explains the meaning and importance of forming a bridge for strength and building the foundation of prayer into our everyday lives. This guide outlines the short simple practices summit host Sabrina does each morning to connect with the ageless part of her being, to be grounded in her heart and body, and to walk through the world with confidence. These are whole-body practices to fuel your womanly senses, lead you to commune with The Mother and The Beloved, and awaken your core through movement and pleasure... while energizing your chakras. This guide will provide you with special secrets for vitality, wellbeing, and weight loss. This is the perfect en·trée to the Radical Metabolism book, which will keep you slimming and anti-aging for years to come. Let yourself be guided through this deeply relaxing breathwork technique that has the potential to change everything and get your energy and life back on track! Benefits can include increased energy levels, improved sleep, toned stomach muscles, relief from depression, anxiety, fear, and anger, lower stress levels, sharper memory, focus and productivity, and more! We each have a perfect natural weight and shape. By remembering how to care for ourselves lovingly, we allow ourselves to rediscover our unique and healthy body. Through yoga and other methods of relaxation and rediscovering our self-care basics, we avoid being a casualty in the collision between human biology and modern society. Learning to eliminate blame and criticism (self-criticism included!) is a key to savoring and expanding in your third act. This simple and powerful activity works. Enjoy! You’ll receive ALL of these bonuses PLUS unlimited access to the powerful tools, resources, and life-changing (and life-giving!) practices you can start applying in your life today! Do you long to be doing your “life’s work?” Are you still trying to discern your true calling and purpose? Do struggle with the conflict between the fire you feel inside and the cultural messages that you’ve already passed your pinnacle, and that there’s nothing much left that’s meant for you in this lifetime? Or maybe you feel that it’s too late to go after your dreams (especially the ones you’ve had since you were a child and never told anyone about!). With The Third Act Wisdom Collection 2018, you’ll be inspired, empowered, and fully equipped to step out of cultural conditioning and internalized belief systems — and into a larger, more luscious life filled with purpose and potential! The visionary women in this series guide you, step-by-step, in making the next move, fulfilling your calling, and embarking on your “third act” journey. 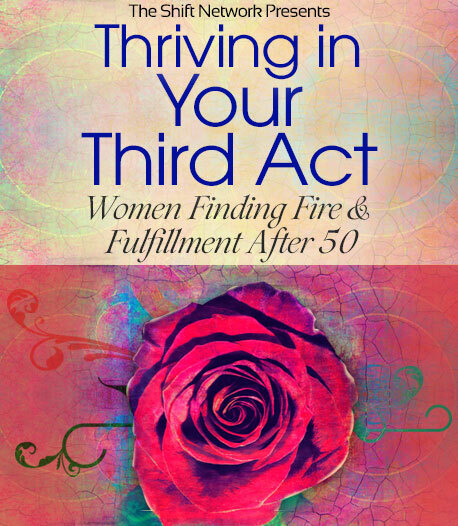 Downloadable MP3 Recordings of EVERY session in the 2018 Thriving in Your Third Act: Women Finding Fire & Fulfillment After 50 summit series — listen on your computer, tablet, or smartphone! PLUS Your BONUS PACKAGE including extraordinary recordings from the 2017 Thriving in Your Third Act summit series, helpful guides and ebooks for finding your health, freedom, and confidence, guided breathwork, and more! When you upgrade today, your purchase is backed by our complete money-back guarantee. If for any reason at any time within 60 days you decide The Third Act Wisdom Collection 2018 is NOT right for you, just visit our Customer Service Center at support.theshiftnetwork.com, and request a refund. We will refund your money completely.